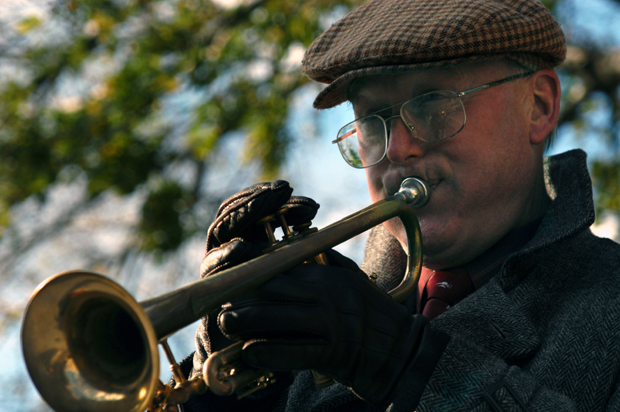 Ted Jacobson plays his trumpet in the small park across from the Henry J. Daly Building at 300 Indiana Ave NW. He said he's there 5 days a week, from 2:30-3:30pm. He works much of the day as an assistant operations technician in a government reproduction office. Ted first started playing the instrument in 4th grade ... and he just turned 60. During his first run on the trumpet he played in several Jazz and Blues bands. After setting his horn down for some years his wife made the suggestion he should pick it up again for the musical enrichment of their children. "You know," said Ted, trying not to blow his own horn, " ... But sometimes people will walk by and say, "Thank you, you really made my day.'" Ted is a featured musician on the child music CD Growing Tunes available through Amazon.